Thief wearing GPS ankle bracelet apprehended - eventually! This story from Engadget, crime spree ends thanks to GPS ankle bracelet, explains how an Ohio man carried out 6 robberies wearing a GPS ankle bracelet. What I'm curious about is how he managed to carry on that long before he was caught ... seems like there's some potential for a rather simple geospatial application there! Last night at the kickoff event for the GITA conference (for the committee, board and staff), Bob Samborski was honored for having served as the Executive Director of GITA for 20 years. Bob has really done a great job over this time, during which GITA has run in my opinion consistently the best independent geospatial conference in North America, as well as carrying out a lot of other educational activities and increasing work on advocacy and applied research. Bob has contributed a great deal to the industry and I hope he will continue to be at the helm of GITA for some time to come still! 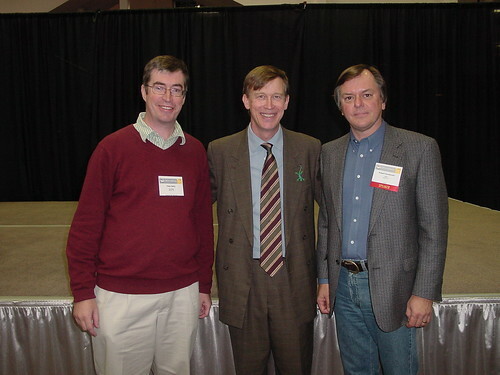 Me and Bob with John Hickenlooper, Mayor of Denver, at the GIS in the Rockies conference in 2004. As Enspiria announced on Friday, I have taken on an advisory role with them. As Chief Technical Advisor I'll be working with them on their technical strategy. They're involved in a number of interesting areas, especially around the integration of geospatial technologies with the "smart grid". Enspiria has a lot of good people, many of whom I've been friends with for a long time, so I'm looking forward to working with them. And it's a flexible arrangement so I can continue to focus most of my time on Spatial Networking (which is coming along well ... more on that very shortly!). I just finished spending a very enjoyable couple of days at the FME User Conference, and am writing this on the train from Vancouver to Seattle, which is an unbelievably cheap $28 for a very comfortable seat and what I’m assured would be a scenic view if it wasn’t dark outside ☺. We have a GITA board meeting in Seattle tomorrow and then I’ll be at the Geospatial Infrastructure Solutions conference there until Wednesday. Anyway, the FME User Conference had a really friendly feel to it. It was a good size, around 140 attendees, so small enough to feel intimate but large enough to have a lot of interesting presentations and discussions. And there were people from 19 countries, so it was very international. Don Cooke was there, founder of GDT, and I was impressed that he took various hands on training classes and was very enthused by all the new things he had learned. Ed Katibah, who heads up Microsoft’s SQL Server development, was there too and we had a good chat about all things geospatial as well as some interesting photographic topics – Ed was already quite into HDR imaging which I mentioned in a previous post, using a product called Photomatix, and he also turned me on to a really cool product called Helicon which lets you produce images with a really large depth of field by taking multiple pictures focused at different distances and combining those into a single sharply focused image. But I digress! Everyone I spoke to there was very positive about their experiences with FME and what Safe Software is doing. Don Murray and Dale Lutz gave several presentations in a very entertaining double act format, which they have perfected over years of working together. They talked about a lot of new features they are delivering in FME 2008, but for me two broad areas stood out. The first was the sophistication of what they are now doing in converting true 3D formats (not just 2.5D – they said that they have had to update all their documentation to reflect a whole new perspective on what they now regard as “3D”). They showed some complex examples like a house model with lots of internal and external details and textures, which translated remarkably well between formats. I also learned that PDF is a 3D format, which I have to confess I didn’t know before! They also showed how they can convert from formats which have more intelligent semantics, like the ability to subtract one 3D shape from another, into less intelligent formats which need to be defined as an explicit set of faces. Clearly the complexity of translating well between these rich 3D modeling formats is much greater than doing plain old 2D or 2.5D formats, and I suspect that this will be a rich market for Safe and could open up whole new areas for them, like game developers who are trying to build realistic virtual worlds from multiple different data sources – in addition to the significant growth we are seeing in 3D geospatial applications in general. Dmitri Bagh of Safe showed off his virtuosity with the new 3D capabilities by generating first some 3D lego bricks imprinted with FME, and then building houses out of these! The second big area was the announcement of FME Server, which I think will prove to be a very significant one for the industry. Even without FME Server, the most notable theme of the various customer and partner presentations I saw was how many people were doing really interesting applications using just FME together with Google Earth to visualize the results. While many people think of FME as being primarily about format translation, and certainly that remains a key differentiator and area of expertise for them, the ability to transform data in a rich variety of ways is now just as important an area, if not more so. I remember seeing a presentation by Don last summer where he said that they had done some analysis which showed that the most common “conversion” that FME customers did was … Shape file to Shape file!!! Which clearly shows that using FME for transformation of data is becoming bigger than translation. Though it should also be said that they now support 220 formats, this number has shown linear growth over the 10+ year history of FME, and the last two releases are slightly above the trend line in terms of number of formats, so translation is certainly not going away as an issue! FME Server makes it even easier to do quite rich analysis and transformation of data, and display this in a tool such as Google Earth or Maps, Microsoft Virtual Earth, or Open Source environments such as OpenLayers. I think we will see a lot more applications using this approach. There were many good customer presentations, I'll just mention two here for the moment. One was from Wes Hardin of engineering firm Burns and McDonnell, who had done some very impressive work to use FME and Google Earth to show 3D renderings of progress on complex electric transmission line construction projects, with lots of detailed data behind the cool graphics. He said that people in the field loved the application the most, closely followed by the VPs – so they had strong support from all levels of the company, and deservedly so. The second was from Majed Khater, GIS Manager at McCarran International Airport in Las Vegas. He began with what I thought were some fascinating statistics about the challenges that the airport faces in general. He had a chart that showed a linear correspondence between the number of hotel rooms in Las Vegas and the number of visitors they had to handle in the airport. He said that for each additional hotel room that was built, they had to handle 320 additional visitors at the airport per year (160 arriving and 160 leaving). There will be 40,000 new hotel rooms built over the next four years or so, which equates to an additional 12.8m visitors a year. They had 47.7m customers in 2007 and regard the maximum capacity of the airport as 55m. They already handle 750,000 people per gate per year, compared to the average airport that handles 450,000. They plan to build a new airport further outside the city but that won’t be ready for around 10 years. So they definitely have some challenges! On top of all this, they recently were faced with a proposal to build a new hotel on the Strip that would be 1888 feet tall, which would make it the tallest building in the US, in a location that interfered with the path of many departing flights. Majed used FME to quickly create a compelling 3D display that included 3D buildings and 3D flightpath data, which helped them to win their argument that the height of the building should be significantly reduced. One other item of interest was the “FME Idol” contest, which loosely followed the format of a well known game show, even down to having Safe’s Mark Ireland in the role of the mean English judge! But instead of singing, contestants had to solve a series of four data translation puzzles in front of a live audience. While I don’t think that FME Idol is going to threatening Simon Cowell’s national viewing ratings any time soon, it was pretty entertaining for the assembled audience, which is probably something of an indication of the “geek rating” of the attendees ☺! Jeff Konnen of Switzerland was the winner of a closely fought contest. Lastly, I was pleased that my keynote presentation seemed to be well received. Recently I have done a lot of 5-10 minute presentations, between lightning talks, panels and investor type presentations, which actually imposes a good discipline and focus on you, but it was nice to have the luxury of being able to waffle for 45 minutes for a change! The previous iteration of my “geospatial technology trends” presentation had done the conference rounds pretty thoroughly, so I had felt it was time for a revamp and I put together quite a lot of new material, which was fun. And I was finally able to unleash the full force of Apple’s Keynote software, after being previously frustrated at FOSS4G in this regard! And I received a really cool speaker gift, a wooden carved sculptural bowl from Fluid Forms that was based on the topography of the Vancouver area – the really clever part is that you can get these for any area of the world, and they cut them based on the elevation data in Google Earth. Definitely a nice gift idea for any "hard to buy for" geospatial people you know! Thanks to everyone at Safe Software and congratulations on running such a great event! I was doing some research for my upcoming talk at the FME User Conference later this week, and came across a really interesting blog called Digital Urban - lots of great stuff on 3D modeling and visualization, and related items. A few examples of interesting posts include this one on a game called Prototype for which they are building some extraordinarily detailed and realistic models of New York City. Check out the following video in particular - the second half is where you really get to see the models they are building (I recommend the high definition version). ...this one on the Da Vinci Tower in Dubai, in which each floor can rotate independently, and the tower includes built in wind turbines which power it and neighboring buildings (there's a high resolution version of the video here). 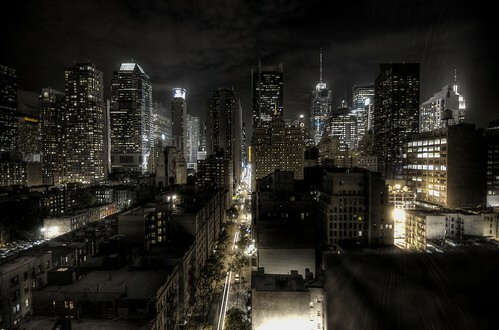 ... and finally I really liked this HDR image of New York by Paulo Barcellos, funnily enough the second time I saw a reference to HDR imaging today, a term I hadn't come across before but there's a good explanation at Wikipedia. There's lots of other good stuff at Digital Urban too, so check it out!